All Fired Up is a Painting Pottery Cafe in Bournemouth. Have fun & be creative! The Pottery Cafe offers a relaxing environment for both adults and children with music playing and soft drinks and cakes available. 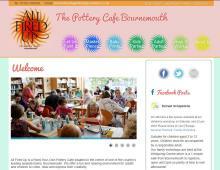 The Pottery Cafe stock a wide range of plates, bowls, mugs, teapots, kitchen items, animals and piggy banks for ceramic painting in Bournemouth. The pottery animals and piggy banks are always a firm favourite at our children’s painting party! Adult pottery painting parties can also be arranged – great fun for a Hen Do or Team Building Event and you can arrange to have the studio to yourselves if booked for an evening. Painting Pottery at All Fired Up isn’t expensive either with the ceramics starting from just £3 plus a small studio fee of £3 per person, however many pieces you paint. This covers the paint, use of the brushes, sponges and design tools plus the glazing and firing of your unique pieces in the kiln. Booking is advised especially at weekends and during the school holidays.